1) Uli Ludwig Computer, as a vendor under the terms of § 6 para. 1 German Packaging Ordinance ("VerpackV"), is obliged to participate in a comprehensive system for taking back sales packaging in accordance with of § 6 para. 3 German Packaging Ordinance ("VerpackV"). This obligation is fulfilled by Uli Ludwig Computer. Packaging material dispatched by Uli Ludwig Computer can be disposed of by the purchaser itself in a "dual system" (e.g. "Green Point / Grüner Punkt" etc.) that complies with the terms of § 6 para. 3 German Packaging Ordinance ("VerpackV"). Alternatively, dispatch materials can be taken back by Uli Ludwig Computer. a) batteries, rechargeable batteries etc. can be returned free of charge to the sales outlet (our dispatch warehouse). You can send batteries back to us, there is no charge for take-back and environmentally-friendly disposal. If you send batteries back to us, please ensure you have paid sufficient postage as, unfortunately, we cannot pay your postage costs. We are only obliged to take back batteries and dispose of them in a proper manner where the said batteries were purchased from us or are otherwise from our product range. Batteries sent to us which are not from our range will be sent back to you at your own expense. b) as the end user, you are legally obliged to return used batteries. It does not matter where you return the batteries; you can return them to local distributors or to a public collection point (e.g. a municipal collection facility). However, you are prohibited in every instance from disposing of batteries, rechargeable batteries etc. in normal household waste. A fine may be imposed on you for such disposal. 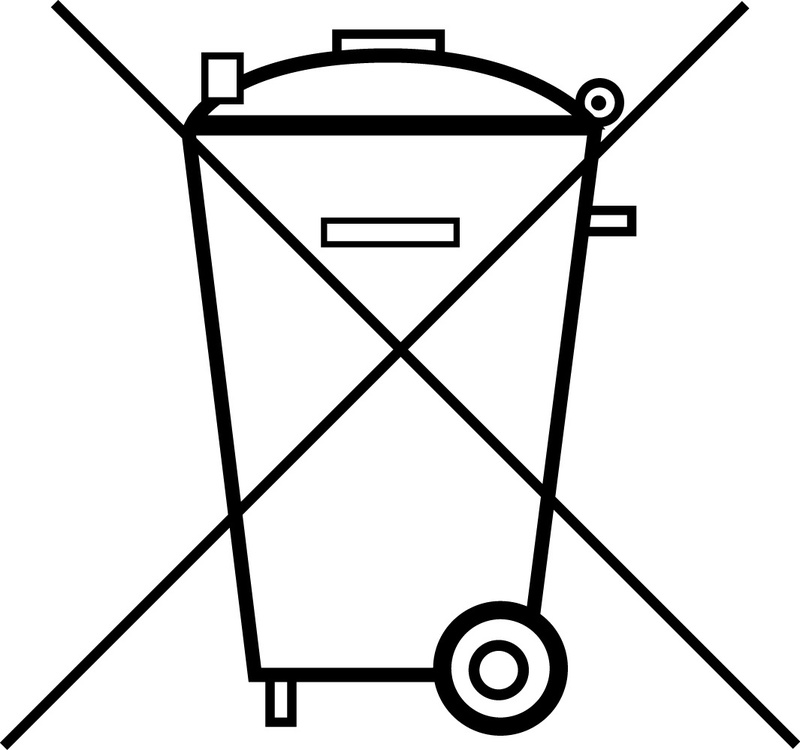 c) the symbol shown above means that disposal in normal household waste or other urban waste (e.g. public refuse bin) is prohibited. Batteries and rechargeable batteries must be disposed of in an environmentally-friendly way and returned to a designated return point. 3) Some batteries bear additional chemical signs such as "Hg" (quicksilver), "Cd" (cadmium), "Pb" (lead). This labelling appears when these chemicals exceed exposure limits according to the German Battery Law (§ 17 para. 3 German Battery Law - "BattG"). 4) Please pay attention to the notices contained in the information documentation with the delivery of goods and/or the manufacturer notices in the respective operating instructions or product information. 5) Further information on the German Battery Law is available on the internet on the website of the German Ministry for the Environment, Nature Conservation and Nuclear Safety at Bundesministerium für Umwelt, Naturschutz und Reaktorsicherheit or on the websites of the German Joint Battery Returns System at "Gemeinsamen Rücknahmesystem Batterien - GRS".